The Plaza Food Hall: Poor quality control. Where’s Todd? 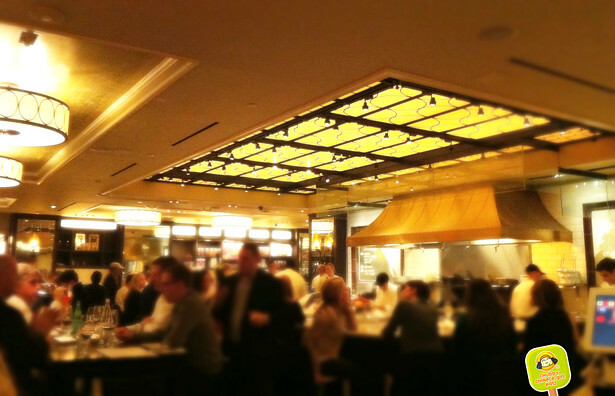 On one of our first dates, StalkerBoy took me to The Plaza Food Hall after a movie at the Paris theater. It was a memorable night, not food wise, but because it was April Fool’s day and I made a pretty mean (funny to me and only me apparently) joke on him (glad he’s still around). During our first visit, we sat by the raw bar, not much action in terms of cooking. This time around, we sat at the counter of the “Asian” section, which aside from turning out overpriced dumplings also did “pasta”?! Anyways… I wasn’t expecting Michelin Star quality or anything like that, but given the price tag and Todd English’s name, you can’t blame me for having some sort of standard right? A wrong order of seafood pasta kept sitting around for 15-2o minutes is just unacceptable. So the “cook” (I wouldn’t call him a “chef” since it would be an insult for anyone who cares and loves food in that profession), made 2 orders of seafood pasta at once. The waiter came back with one order saying the table just got their appetizers. 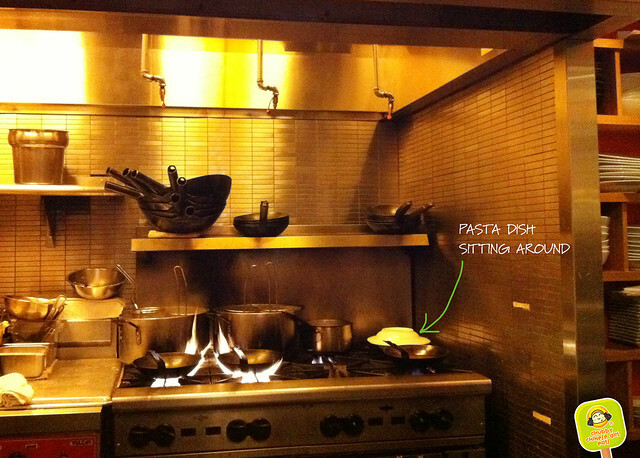 Without missing a beat, the waiter and cook decide its ok to cover it and leave it by the stove to keep warm. The whole time, I was telling StakerBoy, I hope they are just keeping it warm for their own dinner, please don’t serve it to the poor couple. BUT sure enough, they decide to serve it without hesitation after touching the plate to make sure it was warm. All this while I’m watching. At one point they stare back, I must of had the Gordon Ramsay look, having watched my fair share of Hell’s Kitchen. In my head his voice was shouting “Bloody Fool #@$#$#%$#%$%$, make a new one” while smashing the plate on the ground. But this wasn’t reality tv and there was no quality control. Where is Todd? or management? anyone? hello? I mean, we all know at $20, the profit on that pasta dish is quite ridiculous, making a fresh one isn’t really a big deal. 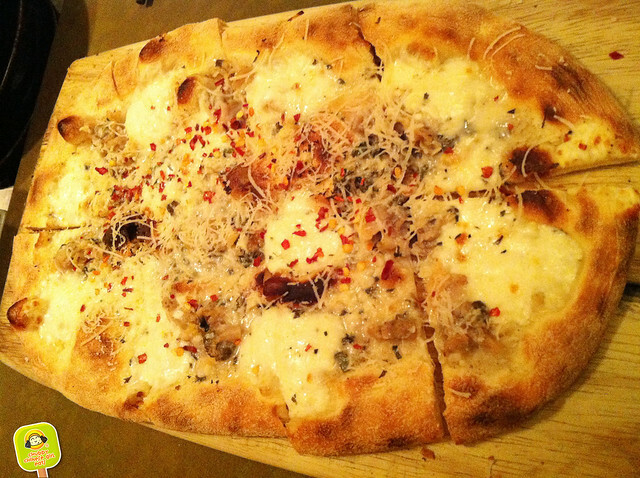 I ordered the WHITE CLAM FLATBREAD PIZZA: little neck clams, garlic, oregano, pecorino. Decent flavors, simple. The crust was crispy and a bit chewy. Pepper flakes gave it a bit of a kick, some bites had way too much. Overall it was good but not $18 good. StalkerBoy wasn’t feeling well and was craving ramen. I was highly against it, but in the end I lost. By the way things turned out, I was right. 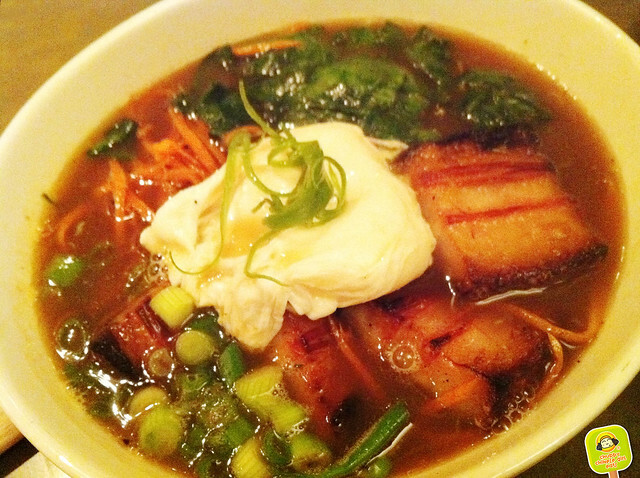 PORK RAMEN: Pork belly, “rich broth”(will explain later), thai chili, spinach, carrot, poached egg. The “rich broth” was dark and coagulated in a tub. When the cook took it out to reheat, we prayed it wasn’t ours, but it was. StalkerBoy still ate it, while dreaming of proper ramen. The pork belly was all fat basically (I prefer a nice marbled balance). At $16 even the egg was overcooked. And though service was ok, who fills the glass to the top like that? The space is quite nice, casual elegant and great for after shopping, but the food is another story. The bill came to about $70!? I had a glass of Riesling. Seriously? I’m pretty certain, I won’t be going back.